Manifesto for Innovation in Europe – Innovation in the Digital Transformation era provides both profound economic and societal transformations, that cannot be separated. 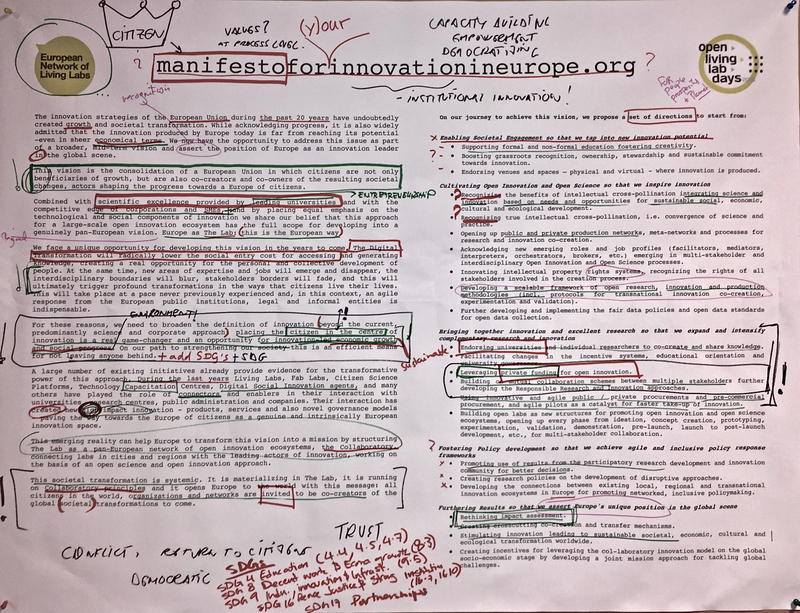 The Manifesto for Innovation in Europe used as an effective instrument for discussion at the Open Living Lab Days in Geneva: People from different institutions and individuals engaged in a fascinating debate. The Manifesto was exposed as a musical piece, in which green marked text appear in the picture as pleasant music (agreed concepts) and red marked text appeared as conflictive sections (disagree, lack of elements, etc.). We invite you to use this result as a starting point for a further open debate ! You can download the Manifesto here.